The topic that we have now started focuses on congruency and similarity. We are finishing up topic 3 and will have our test Monday 1/7/19. Below I am including the home-school connection for Topic 4 to help you reinforce what your child is learning at home. Can you believe it? This first trimester has flown by! With that being said I would like to give an update on what we have covered so far in 8th grade math and what we are currently working on. 7th and 8th grade girls will be attending Expanding Your Horizons which is a free conference and workshop for 7th and 8th grade girls in Maine. This experience will be lead by female professionals in STEM careers. We would like to offer a similar experience highlighting STEM professionals for our 7th and 8th grade boys here, at CDS. This will be occurring on Tuesday, October 9th. This year, with our new math program, it includes a home-school connection for each topic. 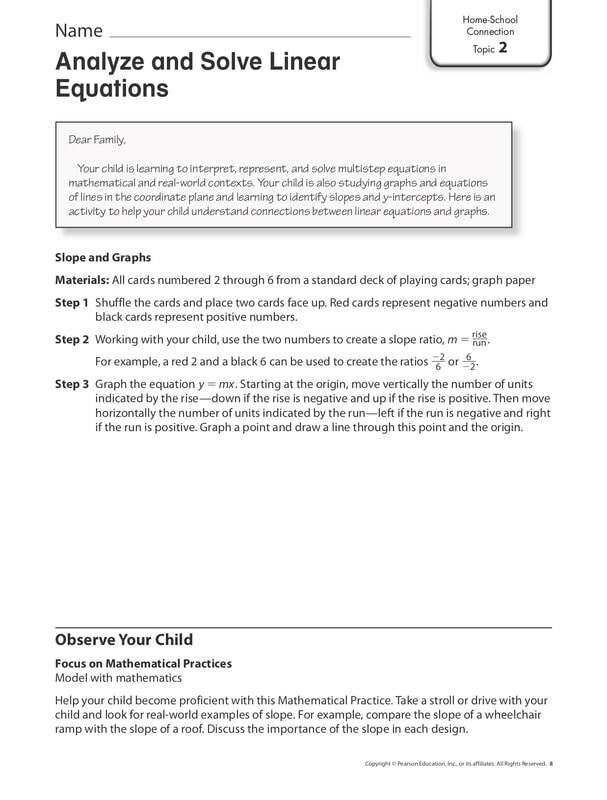 This is a way that you can work with your child on the content we will be covering in math. I will post this to my blog each time we begin a new topic. I am so excited to start this school year with you! I hope you have enjoyed your summer. As we approach the first week of school I would like to make sure you have the following supplies. Open House will be Monday August 27th from 6-7. I hope to see you there!